But no worries i am a tough cookie and I’m fighting it!! Before being hit with this horrific condition, I went shopping this weekend and came across a pair of sandals,similar to the ones above. I simply fell in love… I can’t believe I found a picture that I could share with you:), because silly me i didn’t have my camera with me. I’m still contemplating on buying them..they got me all exited for summer! The chains add glamour and *bling* to the denim…as you know I love denim,as seen in this previous post. Hope you all have a good rest of your week! Previous article3 – day weekend! 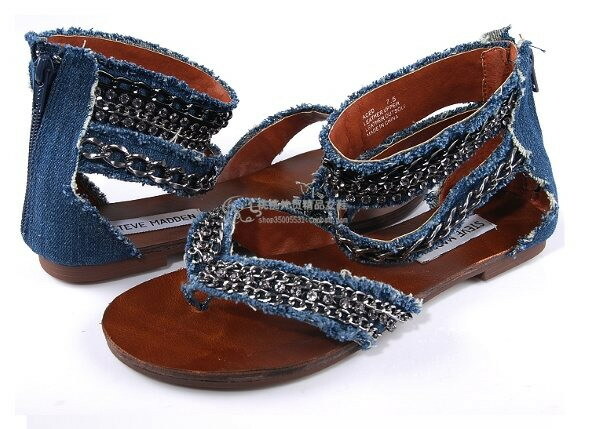 love the wooden colour sole with denim- texture combo. and then the chain is soft, but so effective! Thanks for the sweet comment! yes these sandals are a great addition to a simple summer outfit! I like sandals in this style. I wanted a pair whe the shops in my area were selling them! @Chantel,thanks Chick….got this weird virus which is slowly killing me….but I have surfaced to make a blog post! !Hope you well! @Anthea,I saw them at Luella this weekend…go have a look,glad you like them!! Oh these are pretty! unfortunately it is a bit too wet to be wearing them…boots are the more appropriate attire at the mo! Hi LJ, thank you for the comment! Here in SA we are heading into spring…so these would be great!I presume that you are going into winter:( no worries I love boots,scarves and everything that goes with winter..except the cold and rain!